As has been the story for the past several years, the U.S. economy in 2005 was driven by consumer spending and residential housing investment. The industrial sector gained traction during 2005, despite higher energy prices, and business investment accelerated. The economy added 2 million jobs in 2005, and the unemployment rate fell from 5.4 percent at the end of 2004 to 4.9 percent at the end of 2005. Consumer prices rose at a relatively fast 3.4-percent clip, as energy prices and core demand strengthened. In response, the Federal Reserve System continued its tightening, raising interest rates eight times, to 4.25 percent at the end of 2005. 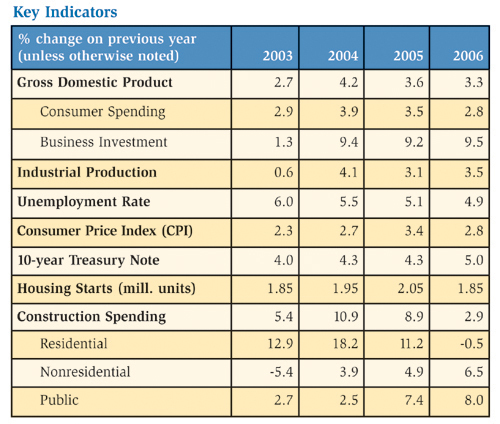 Overall, gross domestic product (GDP) grew by 3.6 percent during 2005. As the economic cycle matures, 2006 will be characterized by moderating expansion. Look for GDP growth of 3.3 percent during 2006, as the business sector fuels growth and consumer spending slows. Stable gains in wages and job growth will support consumer spending in 2006. However, saddled with higher energy bills, higher minimum payments on their credit card debts and slower real estate price appreciation, consumers may be ready to cut back, especially for big-ticket consumer durables and expensive vacations. As a result, consumer spending is expected to grow by 2.8 percent in 2006, down from 3.5 percent growth in 2005. Conditions are favorable for the business sector, which likely will advance 9.5 percent in 2006. Toward the end of 2005, new orders for non-defense capital goods such as machinery, transportation and business equipment were up by 18 percent from the previous year, suggesting momentum in business investment. Additionally, the ratio of unfilled durable orders to shipments, a measure of pent-up demand, was the highest since 2001. Manufacturing capacity utilization is returning to pre-recession levels for many industries; and the manufacturing sector will benefit from global growth and a weaker dollar, which will spur exports. However, corporate profits will slow as businesses are squeezed by higher energy and other commodity prices. As the economy matures further, productivity growth will slow and unit labor costs increase. These higher costs, combined with slower revenue growth, will squeeze profits and dampen business-sector investment going into 2007. Even before Hurricanes Katrina and Rita knocked much of the U.S. energy production infrastructure offline, energy prices were at historic highs for both petroleum and natural gas. The hurricanes caused unprecedented damage to the energy sector. According to the Minerals Management Service, by mid-January 2006, 26.5 percent of petroleum and 18 percent of natural gas production in the Gulf of Mexico remained shut-in. During 2005, petroleum averaged more than $56 per barrel, and natural gas prices averaged $8.40 per million Btu during the year. As the imbalance between growing demand and constrained supplies grows in 2006, so, too, will energy prices. The Energy Information Administration (EIA) projects petroleum prices to average $63 per barrel and natural gas prices to average $9.90 per million Btu during 2006. Energy prices are projected to remain above historic levels for several years to come. This will provide added incentive for the business sector, which must compete globally, to make additional energy efficiency investments. 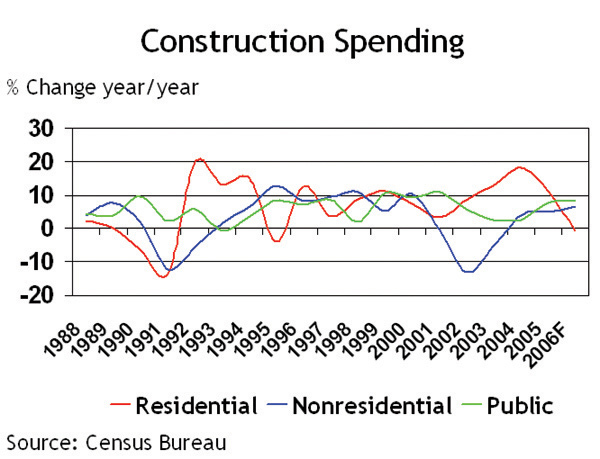 The star of the 2005 economy was the nearly unquenchable thirst for new housing (see Figure 1, Construction Spending). Low mortgage rates and the improvement in the labor market propelled the housing industry to a record 2.05 million housing starts during 2005. Spending on residential construction rose 11.2 percent in 2005, following an 18.2-percent increase in 2004. Higher mortgage rates, moderating income growth, and stricter credit rules are expected to chill residential investment in 2006. New housing starts will slow to a 1.85 million-unit pace, and residential construction spending will contract by 0.5 percent during 2006. At the end of 2005, new orders for construction materials were up 3.3 percent on a year-to-date basis, indicating continued growth in the construction sector. However, as residential construction slows, nonresidential and public building will provide the growth for the construction sector, which is expected to grow by 2.9 percent in 2006. Growth in nonresidential investment of 6.5 percent will be led by increases in office, retail and manufacturing construction. According to Reis Inc., a real estate research firm, the average vacancy rate for office rental space nationwide declined to 14.7 percent by the end of 2005, down from 16.3 percent at the end of 2004. The office rental market absorbed a net 61 million square feet of office space during 2005, and effective rents gained 3.2 percent for the year. Following several years of decline, office construction spending turned around in 2004. Corporate mergers and layoffs may have dampened demand for office space, but job growth will drive the market for office space in 2006. While some rebuilding of hurricane-damaged areas will occur this year, much of this investment will likely be postponed pending land use decisions. Continued improvements in the manufacturing sector will drive investment for new production capacity. Public construction is another area for growth in 2006, as state revenues have risen during the economic growth. Of course, as the price of energy has risen so substantially in the past few years, many new projects may increase investments in energy efficiency, including insulation. One risk to construction growth is the cost of construction materials, which has risen more than other commodities in recent months. This could cause projects to be delayed. Industrial output in the first half of 2005 averaged 3.4 percent, bringing production levels in many industries back to where they were prior to recession (see Figure 2, Industrial Production). While output growth was slowing during the third quarter, it was the unprecedented double impact of the two hurricanes that knocked critical parts of the industrial sector offline during August and September. As energy supplies tightened and prices surged, the availability of many key industrial products was curtailed, including petrochemicals and plastics. Outgoing Federal Reserve Board Chairman Alan Greenspan remarked that these energy disruptions held down industrial production by 0.4 percentage points in August and an additional 1.7 percentage points in September. Nevertheless, industrial output growth resumed at the end of the year, and industrial production grew 3.1 percent during 2005. Looking forward, industrial activity will continue to grow during 2006. Despite the cooling of the housing market, a key market for many industrial goods, the business sector will continue to improve, and spending on business investment in structures and equipment will grow at above-trend rates. Hurricane-related rebuilding also will generate additional demand for industrial goods. Look for industrial production to rise by 3.5 percent in 2006 and 3.2 percent in 2007. Last year was a dramatic one for the $556 billion chemical industry. The industry was challenged from the start due to the high price of natural gas, a key input for petrochemicals, but customer demand was strong and the chemical sector grew at above-trend rates during the first half of the year. Then, it suffered a one-two punch during the hurricanes. First, Hurricane Katrina severely damaged the nation’s natural gas infrastructure, causing prices to reach above $15/MMbtu. Since approximately 70 percent of the U.S. petrochemical sector depends on natural gas feedstocks, many chemical producers felt the pinch of feedstock curtailments and price increases. Then Hurricane Rita struck, knocking out power and causing moderate damage to chemical facilities in the Beaumont, Texas, and Lake Charles, Louisiana, areas. As a result, chemical production in the Gulf Coast region declined by 19.2 percent in September. Total chemical volumes fell by a modest 0.3 percent in 2005, with increases in pharmaceuticals, consumer products and specialty chemicals offset by a 6.8-percent decline in the production of basic chemicals, largely related to the hurricanes. Production of industrial gases, which was harmed by the hurricanes, declined 3.2 percent for the year. As the business sector continues to strengthen, chemical production will increase by 2.7 percent in 2006 and 2.9 percent in 2007, according to the American Chemistry Council (ACC). ACC projects further tightening of chemical capacity utilization rates during the next few years, which will drive capital investment. A $520-billion industry, production of food, beverages and tobacco grew 2.0 percent during 2005. Like much of the industrial sector, capacity utilization in the food and beverage processing sector has tightened to pre-recession levels. Capacity utilization was above 80 percent by the end of 2005 for the first time in six years. Food processors were challenged by high energy prices and some temporary shortages of plastic packaging as the result of the hurricanes. Investment in food processing equipment will be driven by the growing demand for convenience foods, changes in food packaging, inventory control systems and food supply security. The 2005 hurricanes heavily damaged the gas processing infrastructure along the Gulf Coast. Following Hurricane Katrina, 5.55 billion cubic feet (bcf) per day of capacity was offline. At the end of 2005, 5.25 bcf per day of natural gas processing capacity was still inactive. Natural gas production is expected to have declined 3.1 percent in 2005, mainly due to the heavy damage sustained during the hurricanes. EIA projects that production will grow 3.8 percent in 2006 as demand continues to rise and remaining production and processing infrastructure is repaired. Production of ships and boats was up 5.7 percent in 2005, a trend likely to continue as global trade continues to rise. An important shipbuilding market for insulators is refrigerated tankers to transport liquefied natural gas (LNG). As demand for natural gas has surged in the United States and worldwide, shipments of LNG are expected to increase dramatically over the next decade as remote reserves are put into production and gasification and transportation infrastructure is built. According to EIA, U.S. imports of LNG are expected to increase 375 percent by 2015. By the end of 2005, much of the crude oil refining capacity damaged by the hurricanes was restored. According to EIA, refinery capacity utilization rates will tighten from 93.0 percent in 2005 to 94.0 percent in 2006. Refinery capacity will grow from 17.0 million barrels per day to 17.1 million barrels per day during 2006. The U.S. pulp and paper industry continues to be challenged by increasing imports, competition with other materials for packaging and the increasing reliance on electronic communications and transactions. The U.S. market produced 41.3 million tons of paper in 2005, down 0.5 percent from 2004. Looking to the year ahead, plastics prices have risen due to higher energy feedstock prices, which may help some paper producers. However, any gains are likely to be offset slightly by dampening demand for paper due to postage rate increases. According to the American Forest and Paper Association, following several years of capacity contraction, capacity growth in the pulp, paper and paperboard industry will remain nearly flat through 2007. As with any modern economy, growth in electricity generation tracks economic growth. Electricity generation grew 3.0 percent during 2005 as the industrial recovery gained traction. EIA projects that electricity generation will grow by 1.4 percent in 2006 and 1.6 percent in 2007. Following a rapid capacity build during the past decade—especially of natural gas-fired generation—capacity growth at electric generators has moderated in recent years. According to EIA, only 70 gigawatts of electric generating capacity is planned through 2009. Not surprisingly, as natural gas prices are projected to remain historically high for some time to come, coal-based generation accounts for more than half of planned capacity additions in 2009. The outlook is for moderate growth in 2006, with consumers, who have fueled GDP growth during the past five years, taking pause as the housing market cools. The business sector will take the baton and push the economy forward this year. Growth in construction spending will shift gears and be led by business fixed investment rather than by housing, and industrial output will continue its expansion as capacity utilization tightens and production grows beyond pre-recession levels. High energy prices remain a real risk both for consumers and businesses; however, they underscore the need for higher investments in insulation in 2006 and for years to come.